Are the buildings being destroyed Monday because they’re dangerous, or because they’re a canvas for political art? 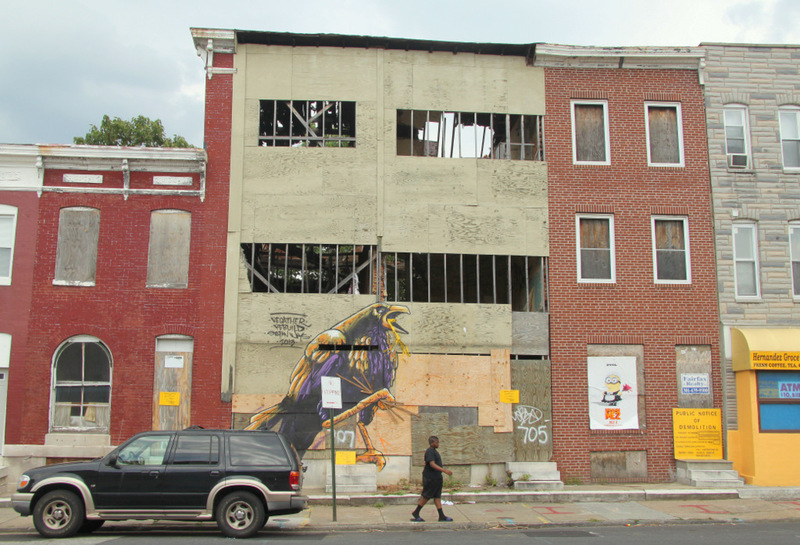 Above: Rowhouses on Patterson Park Ave. where activists recently painted a mural are now set to be demolished. 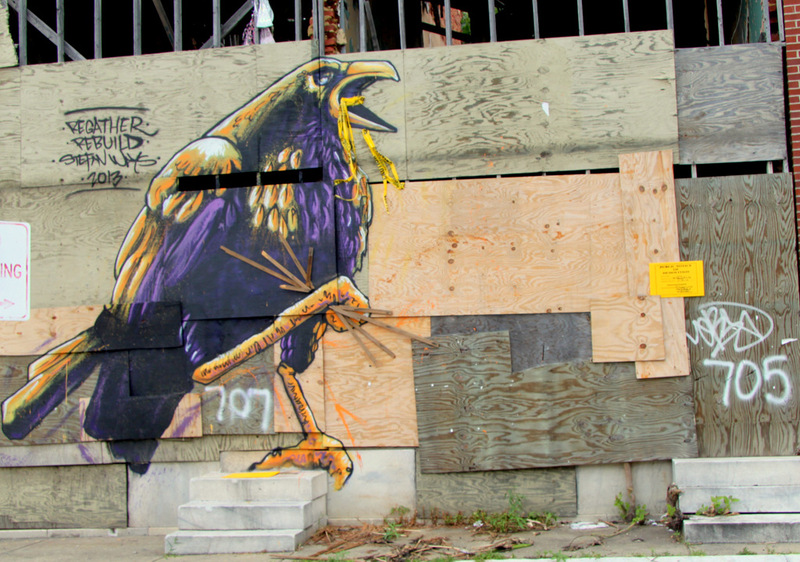 A few weeks ago, street artist Stefan Ways painted a purple, black and gold raven on two decrepit vacant rowhouses in East Baltimore, 705 and 707 N. Patterson Park Ave.
Their campaign, Wallhunters: The Slumlord Project, is aimed at calling attention to the city’s tens of thousands of dilapidated vacant buildings – and calling out their owners, along with elected officials and city bureaucrats. Amplifying the message, QR codes associated with each artpiece link back to a fact-filled post on Ott’s blog, listing owners, violations, etc. This week, Ott was shocked to learn that demolition notices had been posted on the two buildings (and an adjacent rowhouse on either side). The white-and-black QR code they had placed near the mural was gone. 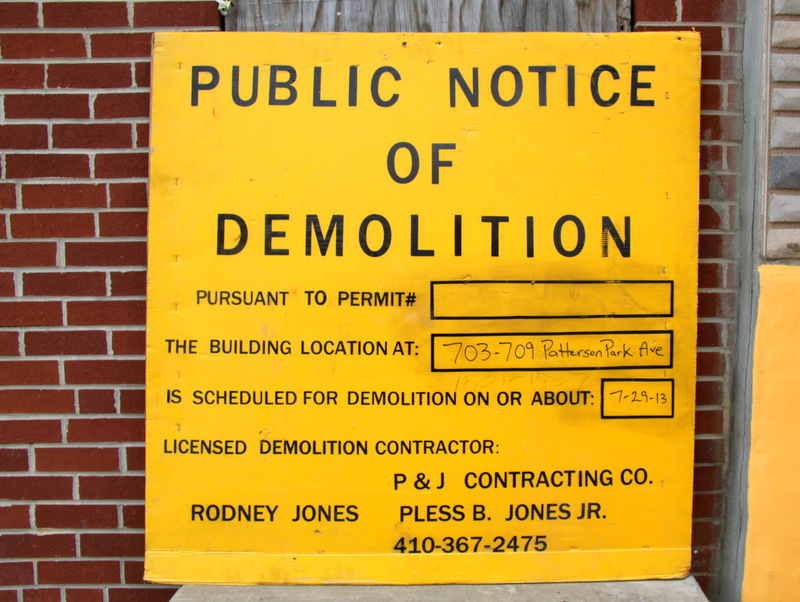 The yellow signs say that on or about July 29 – this Monday – P&J Contracting will demolish the four buildings, 703-709 N. Patterson Park Ave. Under the section on the sign where it says “Pursuant to Permit #____” There was nothing filled in Wednesday. “This is more than a coincidence,” said a furious Ott, speaking with The Brew by phone. Ott acknowledges that the buildings were condemned by the city in 2010 and are extremely dilapidated – the facades were replaced by plywood, the roofs have collapsed. But that description fits thousands of vacant in Baltimore, said Ott, adding that she could find practically no violations on file for the buildings. So when did the city decide to act on these community complaints? Ott was not mollified by this explanation. “I just don’t buy it,” she said. We also wondered about Ott’s opinion on what should have been done about the property, vacant for many years according to neighbors. Ott’s thoughts are there in a July 10 blog post about 705 and 709 N. Patterson Park Ave., which notes that the city “condemned” the properties three years ago, in July 2010. “Why the owners haven’t been forced to either clean up the property or sell it is beyond me,” she wrote. That was basically the reaction of a passerby who lives in the neighborhood. “I’m glad they’re taking them down – it’s dangerous,” said Antonio Young, 29, who works for a masonry company. Back in the mid-90’s all of the buildings on the block had families in them, Young said, looking around at the largely abandoned structures up and down the street. Meanwhile the artist, Stefan Ways, says he’s alright at this point with the destruction of the buildings – and his mural. (It’s brush-painted, with some spray-painted touches and yellow caution tape fluttering from the bird’s beak.) Street artists know their work is inherently temporary, Ways said. 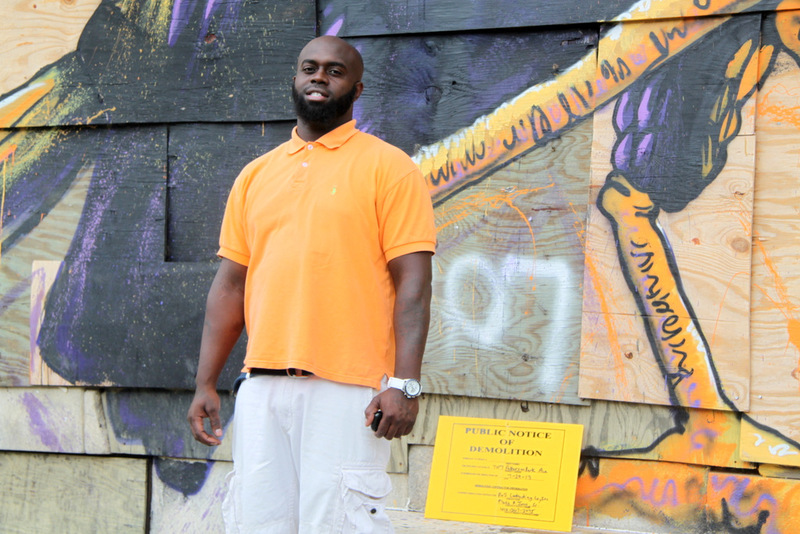 He and Ott and some other artists plan to document the demolition on Monday.